You may have wondered, "What has happened to that Quilting Virgin?" Well, I can assure you that she is still alive and well, but very busy. I actually have done very little quilting in the five months since my last update. To tell you the truth, quilting has been the last thing on my mind. I know, I know, many of you cannot imagine going a day without at least adding a few stitches or dreaming your next quilt in your head. But, alas, as you may know, I am the Quilting Virgin for a reason. I have not yet caught the all-consuming passion that many quilters I know have (I might even side-step it altogether). So, in between my work, kids, and never-ending loads of laundry and stinky diapers, I did squeeze in another project (my first gift quilt). Some friends of ours are having a baby, (as a matter of fact, she is in labor on this very night that I write this), and I thought it would be nice if I could make them a baby quilt (I figure since they are smaller, there is less to mess up). Although I still think paper piecing is the way to go, I mistakenly thought that I was ready to go out on my own since my first quilt turned out well. I thought that I was ready for the big time of quilting—sewing without a net. Or in this case, paper. I picked a pattern on this site that was for beginners and looked relatively easy to do, King's Crown (picture at right is the way it should look). After all, I thought I qualified as a beginner, although that could be because I don't think they have a level lower than that! Is That Supposed to Be a King's Crown? Nothing went right. The one block I did make looked like my 3 year old did it, ok, I admit, maybe my 18 month old. It was just plain awful. How awful could it be, you ask? None of the seams were even; a few of them somehow missed the machine and didn't even get sewn. None of the corners matched, my poor little King's Crown block looked like it had drunk too much mead and fallen off its throne. Witness Exhibit A! I know, many of you are saying "You're exaggerating, you should have seen my first project, it was pretty bad". Well, you can see for yourself, I am not overstating my complete and utter failure to sew a straight line. However, on the bright side, I do think that if they were giving out medals for the "Worst Sewn Block Ever", I could be going for gold. It also solidifies my position of Queen Quilting Virgin; I doubt my crown could be overthrown anytime soon, so I've got that going for me. I couldn't tell you how this happened, I had even put a little marker on my sewing machine at the �" mark to make my seams even like my MIL (otherwise known as Mother-in-Law) showed me. That little marker must have some defect or something—no one can sew that bad! So like a dog (feed dog?) between her legs, I crawl back to paper piecing. This time, I chose a pattern out of a baby quilt paper-piecing book by Carol Doak (I have yet to see a paper-piecing book that she didn�t write!) that seemed pretty easy. 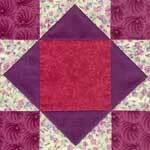 It was alternating pinwheels and plain squares (no piecing on those, yah! 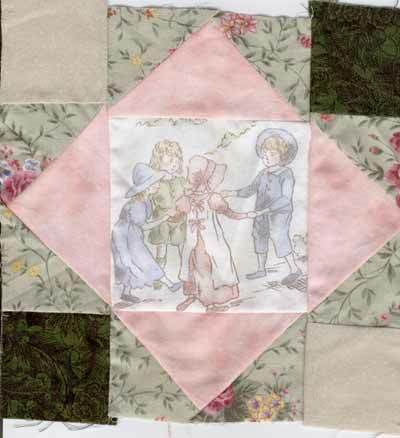 ), so I used my coordinating colors for the pinwheels and the toile fabric for the plain blocks in between. Wow, my paper-pieced block turned out a million times better than my attempt at the free-hand block (apparently I should be barred from using the sewing machine unless I have a piece of paper attached to my fabric!). The points of my pinwheels match in the middle (mostly) and it actually looks like a real block! I seriously don't know how anyone can make a block without paper, to me, it seems impossible. So I finally finished my 13 pinwheel blocks that make up the center, which seemed like they took FOREVER to do. Well, to be honest, the actual piecing part gets very boring to me; I get tired of doing the same block over and over again. I may be going out on a limb here, but I am getting the feeling that I am not "cut out" (no pun intended) to be a quilter. I love designing (and I use that term loosely) the quilt and picking out the fabrics and pattern, but actually doing the sewing gets so boring, it almost feels more like homework than fun (doesn't that bring back memories). Perhaps if I actually knew how to sew or had any idea of what I was doing, it might be more fun. Anyway, my MIL comes to my rescue again. The original pattern calls for 13 blocks in the center part combined with 12 large squares, then 4 blocks in each corner. Well, I just couldn't get those last 4 blocks done, so MIL suggests we forget those (LOVE her) and just put borders around the whole thing. Easy, right? Well, there's another thing I am not good at, selecting which fabrics should be borders and in what order. Whew! Finally finished. After agonizing for over an hour of which border goes where, my MIL comes in and in two minutes flat suggests the perfect combination. Then she does something magic to the machine that makes it quilt so well (ok, maybe that's just her). She also magically changes some settings on the machine that I had no idea could be changed, as well as adding a "walking foot" (which to me sounds more like a condition you get from hiking than a sewing utensil) that she pulled out of a compartment I didn't even know existed. Apparently, I still have A LOT to learn! 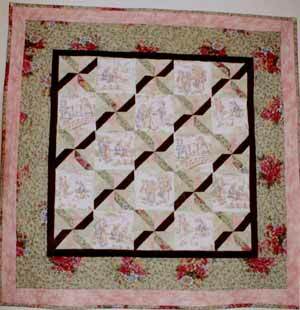 I don't know yet how my king's crown block failure will affect my future as a "real quilter". But, I think I might try a few non-quilting projects to practice "sewing", and then give it another try. Don't be surprised if you don't hear from me for a while, though. I do have a request for all you quilters out there. Just for fun, I would like to see how my "Worst Block" measures up, and if I really deserve the gold medal for the "Worst Sewn Block/Quilt Ever". 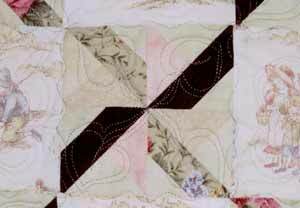 Submit a picture and brief story of your bad blocks or quilts, and we'll have an on-line exhibit of these "Worst Blocks". 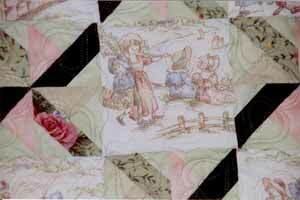 If I could see someone else's bad sewing, perhaps it would make me and every other bad quilter out there feel better! Send your Awful, Horrible, Bad, Deformed, Misshapen, or just plain UGLY blocks to JanetHawks@theQuilterCommunity.com and make my day!